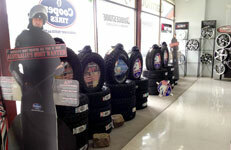 At Carmody’s Tyre Service we carry the best range of Tyre and Wheel products in Gippsland, specialising in products such as CSA Alloy Wheels, Cooper Tyres, Bridgestone and Yokohama to name a few. Come and take a look in our Sale store out our range and many displays, or just stock up on some fuel. When it comes to wheels and tyres, we know our stuff! We have a great range of tyres in store! We carry the best range of Tyre and Wheel products in Gippsland, specialising in products such as CSA Alloy Wheels, Cooper Tyres, Bridgestone and Yokohama to name a few. Carmody offer the biggest range of quality products to suit every application. Established in 1956, we stock only quality brands including PriMax, Pennzoil, Caltex and more.Stop by our station and take a look out our range or just grab some fuel! Please fill in the form to the right to contact us!